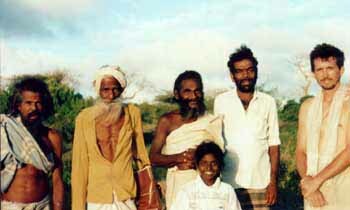 Some of the 1990 Kataragama Pada Yatra pilgrims including the author at far right. 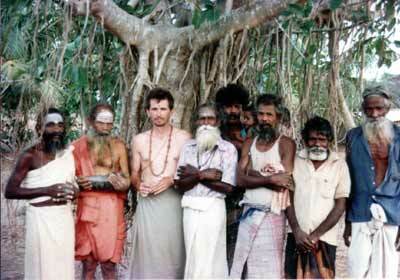 Only the hardiest pilgrims managed to reach Tiruketeeswaram Temple near Mannar in 1990. For most Sri Lankans, June 11 1990 marked the beginning of an ugly phase of an age-old conflict, the cost of which can scarcely be measured by the number of lives lost or ruined. Rather, something far subtler has been at stake than the profile of this island's political and economic machinery. A war is now going on that may ultimately change the course of histsory in ways that few would have dared to imagine. And not just the history of this small nation alone for Sri Lanka has also been compared to a barometer of events that may repeat themselves the world over. June 11 was also, coincidentally, the first day of this year's annual Kataragama Pada Yatra, a travelling festival and matter of interest to Sri Lankans of all ethnic backgrounds.  The Pada Yatra or 'foot pilgrimage' traces the hallowed foot steps of countless swamis, fakirs, sadhus and devotees who have walked this way to Kataragama yearly from time immemorial. Indeed, as local legends tell us, Lord Kataragama Himself, the playful yet powerful child-like spirit of love, war and mystery, also once visited and still imhabits these shrines in His own inscrutable fashion. My own meagre training in South Asian languages and civilization at American universities could scarcely prepare me for the scle of intricacy of Sri Lanka's vibrant cultural heritage. More helpful perhaps were the earlier years spent here in pursuit of Dhamma (Justice) and the power that upholds it. It was a quest that soon brought me to Kataragama and to the mostly poor men and women who embody its rich spiritual traditions. Now, almost twenty years later, it has been my lot to witness and report on this aspect of Sri Lanka's and the world's vanishing heritage. Admist the carnage and confusion of an increasingly violent conflict between two sides that, ironically, both declare ahimsa (non-violence) to be the cornerstone of their cultures few Sri Lankans today give more than a passing thought to the guiding principles underlying the culture they so passionately profess to defend. Not to kill or cause suffering, not to rob or cheat, not to speak or act untruthfully these are among the principles that have fallen victim to deceit and self-interests. It may surprise many, then to learn that this year's Pada Yatra even started at all. And that a handful of the 200-300 devotees who undertook to walk from June 11 kept going for nearly a month. Finally they disbanded near Mannar on July 9 after four weeks of travelling under gruelling conditions with the war always close at hand. I was privileged to walk with the Pada Yatra pilgrims to see how they coped with food scarcity and an atmosphere conducive to terror. Terror and drama are nothing new to devotees of Lord Murugan, the tender war god who, local tradition says, quit India long ago to settle in Kataragama. There, the god's divine play is said to continue up to this day, shrouded in mystery and revealed only to the pure of heart. Its theme, they say, has not changed, though outwardly it is different. Murugan's principal enemy, even in the oldest accounts which are at least 2,000 years old, was terror personified, and was called Cur. Hunger, disease, malevolent spirits, marauding enemies these were the faces that terror wore in those days. Add to this the spectre of modern warfare with its aerial bombs, land mines, helicopter gunships, terrorist tactics, etc. and one comes face to face with an ancient foe risen from the grave, as it were. This fear or terror is not altogether unreasonable. This fact came home to me most graphically one morning in Jaffna recently as bombs and shells were exploding not far away. One stray bullet, still hot to the touch, landed at my feet. Suddenly any moment could be one's last in this life. It is just such concrete fears that are exploited in modern conflict to 'get a handle' as Americans would say on masses of people, to manipulate whole populations through fear. But seldom do the exponents of terror realize that in promoting terror they are serving as terror's agents and placing themselves at odds with a god who loves justice. No Sri Lankan even in the worst of times should forget that the gods and demons, devas and asuras, are still powerful here. The swamis, bawas and ammas of the Kataragama Guru Parampara, so I and other modern students of Kataragama have learned, still lead their lives according to such principles. Even as our party of pilgrims found itself hemmed in by a reportedly advancing and hostile army on the one and surrounded by a guerrilla force of demonstrated ruthlessness on the other, the story-tellers in the group were comparing the struggle to a much greater war between angelic forces led by god Murugan and the rival demonic forces dominated by Cur. In the same way, I recalled our Islamic bretheren speak of two Jihads (holy wars) the lesser fought outwardly and the greater Jihad within one's own heart. This subtle angelic warfare is also described in Indian mythology as well as local legends. The Lankan warlord Ravana, like Cur, also had many different faces or aspects, masquerading under different guises of forms, most of which may appear to be perfectly reasonable and harmless. Of course, in legend Kataragama Murugan also joins in this game of hide and seek, of disguise, trickery and surprise. He is only superior to Cur himself, whose shadowy non-existence is finally exposed in the end. Thus it was god Murugan's familiar assurance 'When I am, why fear"? that came up over and over in the Pada Yatra pilgrims' frequent discussions about where, when and how to proceed further. 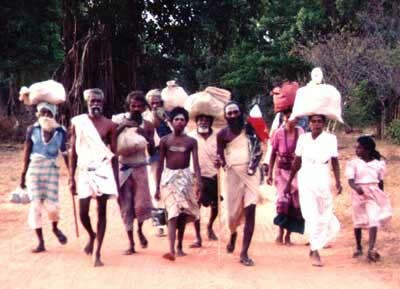 Tamil refugees, first by the hundreds and later by the thousands, could be seen moving in the opposite direction from where we were intending to go. It seemed incredible to them that we even entertained the thought of walking towards Kataragama at all at a time like this. 'Coursing against the stream' has long been a common motil in Eastern thought. But here the pilgrims themselves were literally coursing opposite to the stream of humanity headed away from Kataragama. 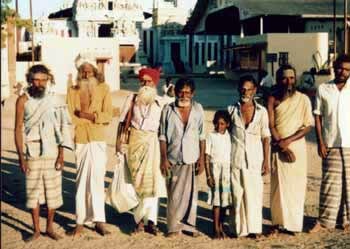 The small band of Pada Yatra pilgrims meant to walk straight towards the danger area, with only their faith in Kataragama-Murugan to protect them. It is but one of the many ironies of Kataragama that the same path that for some is the yellow brick road to Kataragama is for others a trail of fear and for yet others a warpath or battleground. As peaceful as the pilgrims' intentions were, in many ways they resembled the combatants. Like them, the pilgrims also had their own camps, plans, and objectives. For they were and still are at war with fear itself footsoldiers marching under the command of their Divine Commander. Perhaps because of the villagers' regard for Kataragama and the steadfast faith of the Pada Yatra pilgrims, hospitality and donations of food could be found everywhere even when the shops were closed or nearly empty. While fear and want stalked us, no pilgrim went hungry and all enjoyed each day despite the undoubted hardships. The Pada Yatra pilgrims tried first walking down the traditional Eastern coastal route but were turned back by Tamil combatant forces. They tried to go via Vavuniya and found that the roads there were also closed. Lastly they went as a group to the West coast by whatever means available. They went as far as Tirukketeeswaram Kovil but there also fierce fighting near Mannar sealed off the last possible land route to Kataragama. Finally they recalled the Tamil saying ellām avar ceyyal ('It is all his doing'). Now they are waiting for next year to try again. The very same occurences that we from our limited human perspective call problems and troubles may be for him small but essential parts of His divine play. Or is it His divine war-game, as the playful Child war god's case may be? Many are the faithful who declare that it is all His doing, whatever it may be. And they in their own low-key fashion may be the real defenders of a marvellous spiritual heritage.